1.MEWPs where the center of the work platform stays within the perimeter of the chassis at all times. Scissor lifts and vertical lifts are examples of this type. 2.MEWPS where the center of the work platform can extend beyond the chassis. These mostly refer to boom lifts. -MEWPs that can travel only in the stowed position. These must be moved manually. -MEWPs that are controlled from the chassis and can be driven while the platform is elevated. -MEWPs that have controls on the work platform and can be driven while the platform is elevated. To improve safety, ANSI A92 will require new aerial lifts to be equipped with two types of sensors. One sounds an alarm and prevents the machine from operating when the load exceeds safety limits. The other is a tilt sensor. It triggers an alarm and prevents movement of the chassis or work platform when the slope level gets too steep. -MEWPs can no longer use chains to close off entrances to the work platform. Instead, they must use gates that include toe guards. -MEWPs used for outdoor work must have wind speed sensors. This will allow operators to reduce workloads in windy conditions. -MEWP platform railings must be at least 43.5 inches in height. The old standard was 39 inches. -MEWPs used on rough terrain must be outfitted with solid or foam-filled tires. This will help improve the stability of the MEWP. Operators will also be responsible for providing basic training to others working on the platform with them. Maintenance workers must be trained to repair and maintain MEWPs to manufacturer and ANSI standards. -Having a site- and equipment-specific rescue plan. This written plan should detail how to get an operator down if the lift stops functioning while elevated. -Operators must familiarize themselves before operating a type of MEWP they haven’t used before. This includes reading the operator manual. -Operators must explain to other workers on the lift how to get down if something happens to the operator. -Every site must have at least one person who can operate the equipment from the ground if the crew can’t lower themselves. -Maintenance workers must be trained on all new features, such as the tilt and load sensors. ANSI standards are voluntary. However, not following them could be considered a violation of OSHA’s “General Duty” clause. This clause requires employers to keep the workplace free from recognized hazards. As of 2018, fines for these types of violations can range from $12,934 to $129,336. Of course, worker safety is always the highest priority. That’s where MEWP training and certification is so important. These days, you can get fast, affordable training online. You can also get training and certification on specific types of MEWPs, such as cherry pickers or scissor lifts. 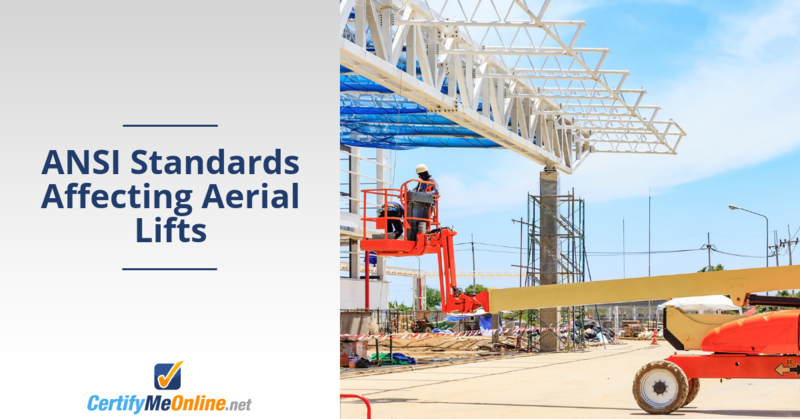 The new ANSI standards will be enacted soon. Why wait to get the training required to meet the new standards?